In rats, six cytochrome P450 (P450) 2D isoforms have been genetically identified. Nonetheless, there is little evidence of catalytic properties of each CYP2D isoform. In this study, using recombinant CYP2D isoforms (rat CYP2D1, CYP2D2, CYP2D3, and CYP2D4 and human CYP2D6) or hepatic microsomes, we investigated the catalytic specificity toward bufuralol, debrisoquine, and propranolol, which are frequently used as CYP2D substrates. Bufuralol was oxidized to three metabolites by rat and human hepatic microsomes. 1′-Hydroxybufuralol was the major metabolite. 1′2′-Ethenylbufuralol, one of the others, was identified as a novel metabolite. The formation of 1′-hydroxybufuralol and 1′2′-ethenylbufuralol in hepatic microsomes was inhibited by anti-CYP2D antibody, suggesting that these metabolites were formed by CYP2D isoforms. All rat and human recombinant CYP2D isoforms possessed activity for the 1′-hydroxylation of bufuralol, indicating that this catalytic property was common to all CYP2D isoforms. However, the 1′2′-ethenylation of bufuralol was catalyzed only by rat CYP2D4 and human CYP2D6. Debrisoquine was oxidized to two metabolites, 3-hydroxydebrisoquine, and 4-hydroxydebrisoquine, by hepatic microsomes. Recombinant CYP2D2 and CYP2D6 had very high levels of activity for the 4-hydroxylation of debrisoquine with lowKm values. Only CYP2D1 had a higher level of 3-hydroxylation than 4-hydroxylation activity. Propranolol 4-hydroxylation was catalyzed by CYP2D2, CYP2D4, and CYP2D6. The 7-hydroxylation of propranolol was catalyzed only by CYP2D2. In conclusion, in rats, bufuralol 1′2′-ethenylation activity was specific to CYP2D4 and debrisoquine 4-hydroxylation and propranolol 7-hydroxylation activities were specific to CYP2D2. These catalytic activities are useful as a probe for rat CYP2D isoforms. Cytochrome P450 (P4501) 2D isoforms have been identified in several mammalian species and are involved in the monooxygenation of various chemicals including antidepressants (e.g. desipramine), β-blockers (e.g. propranolol), antiarrhythmics (e.g. sparteine), and others (e.g. dextromethorphan and methadone) in the liver (Eichelbaum and Gross, 1990; Gonzalez, 1996). In humans, only one isoform, CYP2D6, is expressed in various tissues including the liver, kidney, brain, placenta, breast, and lung (Niznik et al., 1990;Romkes-Sparks et al., 1994; Carcillo et al., 1996; Hakkola et al., 1996; Guidice et al., 1997; Huang et al., 1997). On the other hand, in rats, six isoforms (CYP2D1, CYP2D2, CYP2D3, CYP2D4, CYP2D5, and CYP2D18) have been identified by genomic analysis (Kawashima and Strobel, 1995; Gonzalez, 1996; Nelson et al., 1996). Among these six, CYP2D5 and CYP2D18 have over 95% similarity in amino acid sequence to CYP2D1 and CYP2D4, respectively (Gonzalez et al., 1987; Matsunaga et al., 1989; Kawashima and Strobel, 1995). Similar to human CYP2D6, the six rat CYP2D isoforms are expressed in various tissues such as liver, kidney, and brain (Komori, 1993; Hellmold et al., 1995; Kawashima and Strobel, 1995; Masubuchi et al., 1996; Zhang et al., 1996; Hiroi et al., 1998). Interestingly, the mRNA of each isoform showed a specific tissue distribution in our previous study (Hiroi et al., 1998). CYP2D2 and CYP2D3 mRNAs are mainly expressed in the liver, kidney, and small intestinal mucosa, which are constantly exposed to xenobiotics such as drugs, food components, and environmental contamination. In contrast, CYP2D1/5 mRNA is expressed systemically in various tissues. CYP2D4/18 mRNA is expressed in brain, adrenal gland, ovary, testis, and gonecystis, in addition to liver, kidney, and small intestinal mucosa. CYP2D4 has also been identified in rat breast (Hellmold et al., 1995). The specific tissue distributions of the rat CYP2D isoforms suggest that each isoform has specific catalytic properties and plays specific roles in various tissues. However, very little information on the similarities and/or differences in catalytic properties among these six isoforms is available at present. It is difficult to purify each CYP2D isoform from rat tissues, because of their highly homologous amino acid sequences (Gonzalez et al., 1987; Matsunaga et al., 1989; Matsunaga et al., 1990; Kawashima and Strobel, 1995). To solve this problem, we isolated full-length cDNAs of rat CYP2D1, CYP2D2, CYP2D3, and CYP2D4 and human CYP2D6. Each enzymatic protein was expressed in yeast cells, and each recombinant enzyme was used as an isolated enzyme (Imaoka et al., 1996; Wan et al., 1997). In the present study, we focused our effort on the catalytic similarities and differences between rat CYP2D isoforms and investigated the catalytic activities of five recombinant isoforms (human CYP2D6 and rat CYP2D1, CYP2D2, CYP2D3, and CYP2D4) toward bufuralol, debrisoquine, and propranolol, typical substrates for CYP2D. We found specific activity for rat CYP2D2 and CYP2D4 and the activities to be useful as a probe for these isoforms. Debrisoquine, 4-hydroxydebrisoquine, bufuralol and 1′-hydroxybufuralol were purchased from Daiichi Pure Chemicals Co., Ltd. (Tokyo, Japan). 4-Hydroxypropranolol, 5-hydroxypropranolol, 7-hydroxypropranolol, andN-desisopropylpropranolol were kindly provided by Dr. Narimatsu (Okayama University, Okayama, Japan). NADPH was obtained from the Oriental Yeast Co., Ltd. (Tokyo, Japan). Propranolol, other reagents and organic solvents were obtained from Wako Pure Chemical Industries (Osaka, Japan). Expression of Human and Rat CYP2D Isoforms in Yeast Cells. Rat CYP2D1 and CYP2D3 cDNAs were isolated from a rat liver cDNA library. Rat CYP2D2 cDNA was amplified from the rat liver cDNA library by PCR. Rat CYP2D4 cDNA was amplified from rat brain total RNA by reverse transcription-PCR. Human CYP2D6 cDNA was amplified from a human liver cDNA library by PCR. CYP2D1, CYP2D2, CYP2D3, CYP2D4, and CYP2D6 enzymes were expressed in Saccharomyces cerevisiae, as reported previously (Imaoka et al., 1996; Wan et al., 1997), and the microsomal fraction was prepared from yeast cells and used as recombinant enzyme. The total P450 contents of recombinant CYP2D1, CYP2D2, CYP2D3, CYP2D4, and CYP2D6 were 4.88, 0.25, 1.08, 4.91, and 2.16 nmol/ml, respectively. Rat and Human Hepatic Microsomes and Purified P450 Isoforms. Male Sprague-Dawley rats weighing 200 to 250 g were obtained from Nippon Clea (Tokyo, Japan). Rat hepatic microsomes were prepared as reported previously (Funae and Imaoka, 1985). Human hepatic microsomes were obtained from the International Institute for the Advancement of Medicine (Exton, PA). Eight isoforms (CYP1A1, CYP1A2, CYP2A2, CYP2B1, CYP2C11, CYP2D1, CYP2E1, and CYP3A2) of rat P450s were purified from rat hepatic microsomes as described previously (Funae and Imaoka, 1985;Funae and Imaoka, 1987; Funae et al., 1988; Ohishi et al., 1993). Antibodies against CYP2D isoforms were raised in a female Japanese white rabbit using rat CYP2D1 purified from rat hepatic microsomes as the immunogen (Ohishi et al., 1993). Anti-CYP2D antibodies recognized all rat and human CYP2D isoforms and inhibited the catalytic activity of CYP2D (Wan et al., 1997) but not that of other CYP2D isoforms. Bufuralol (10 nmol) or debrisoquine (50 nmol) was incubated with recombinant CYP2D isoform (10 pmol) or hepatic microsomes (0.2 mg) and NADPH (0.2 μmol) in a final volume of 0.5 ml of 0.1 M potassium phosphate buffer, pH 7.4, at 37°C for 10 or 15 min. The reaction was started by adding NADPH and stopped with 20 μl of 60% perchloric acid. After centrifugation, the supernatant was injected into a high-performance liquid chromatography (HPLC) system with a TSKgel ODS-120T column (4.6 × 250 mm; TOSOH Corp., Tokyo, Japan). For the bufuralol oxidation assay, the column was isocratically eluted with 1 mM perchloric acid/30% acetonitrile at a flow rate of 1.0 ml/min at 50°C. The detection of metabolites was carried out using a fluorometric detector (FS-8011; TOSOH Corp.) with the excitation (Ex) and emission (Em) wavelength set at 252 and 302 nm, respectively. 1′-Hydroxybufuralol was identified by comparing its retention time with that of the authentic compound. For the debrisoquine oxidation assay, the column was isocratically eluted with 2 mM tetrafluoroacetic acid and acetonitrile (88:22) at a flow rate of 1.0 ml/min at 45°C. The metabolites were monitored at 219 nm (Ex) and 286 nm (Em). Propranolol (50 nmol) was incubated with recombinant CYP2D isoform (10 pmol) and NADPH (0.2 μmol) in a final volume of 0.5 ml of 0.1 M potassium phosphate buffer, pH 7.4, at 37°C for 10 min. The reaction was started by adding NADPH and stopped with 1 ml of 1 N NaOH. The metabolites were extracted with 3 ml of ethyl acetate. The organic phase was evaporated under a vacuum, and the residue was dissolved in the mobile phase for HPLC. Thereafter, 100 μl of the solution was injected into an HPLC system with a TSKgel ODS-120A column (4.6 × 250 mm; TOSOH Corp.). The column was isocratically eluted with methanol, acetic acid, acetonitrile, and H2O (10:0.9:20:70, v/v) at a flow rate of 1.0 ml/min at 45°C. The metabolites were monitored at 310 nm (Ex) and 380 nm (Em). Qualitative Analysis by Liquid Chromatography/Mass Spectrometry (LC/MS). 1′-Oxobufuralol (M1-bufuralol), 1′2′-ethenylbufuralol (M2-bufuralol), and 3-hydroxydebrisoquine (M1-debrisoquine) were identified by LC/MS. Mass spectral data on 1′2′-ethenylbufuralol and 1′-oxobufuralol were obtained with an LCQ ion-trap mass spectrometer (Thermo Finnigan, San Jose, CA) operating in the positive ion spray mode, set with a spray needle voltage of 4.5 kV, capillary temperature of 225°C, sheath gas flow of 80 U, and auxiliary gas flow of 10 U. A TSKgel ODS-80Ts column (4.6 × 250 mm; TOSOH Corp.) was used for separation. The column temperature was maintained at 40°C. The mobile phase consisting of 0.1% trifluoroacetic acid and acetonitrile (90:10, v/v) was delivered at a flow rate of 1 ml/min. Mass spectral data for 3-hydroxydebrisoquine were obtained with the same mass spectrometer also operating in the positive ion spray mode, set with a spray needle voltage of 4.5 kV, capillary temperature of 275°C, sheath gas flow of 85 U, and auxiliary gas flow of 15 U.
Debrisoquine (20 μmol) was incubated with recombinant CYP2D1 (5 nmol) and NADPH (13 μmol) in a final volume of 10 ml of 0.1 M potassium phosphate buffer, pH 7.4, at 37°C for 20 min. The reaction was started by adding NADPH and stopped with 200 μl of 60% perchloric acid. After centrifugation, the supernatant was evaporated to dryness and dissolved in 0.5 ml of water. The solution was applied to a preparative HPLC column (21.5 × 300 mm, TOSOH Corp.), and the column temperature was maintained at 40°C. The mobile phase containing 0.1% trifluoroacetic acid and acetonitrile (90:10, v/v) was delivered at a flow rate of 6 ml/min. The eluate containing 3-hydroxydebrisoquine was collected by monitoring at 215 nm and evaporated to dryness. The residue was dissolved in [2H]acetonitrile (CH3CN) and subjected to1H-NMR measurements with a NMR spectrometer (UNITY INOVA 500; Varian Inc., Palo Alto, CA). Enzyme kinetic parameters (Km andVmax) were analyzed according to a nonlinear least-square regression based on the Michaelis-Menten equation using the computer software Microcal Origin (version 5.0J, Origin LabCorp, Northampton, MA). Bufuralol is a typical substrate for CYP2D isoforms. The level of 1′-hydroxybufuralol, a major metabolite of bufuralol, is often measured as an index of CYP2D activity and/or levels, and the amount of 1′-hydroxybufuralol formed from bufuralol is known to be small in CYP2D6-deficient metabolizers (Gonzalez, 1996). The HPLC profile of bufuralol metabolism by rat hepatic microsomes is shown in Fig.1a. Bufuralol was metabolized to three metabolites, namely 1′-hydroxybufuralol, M1-bufuralol, and M2-bufuralol. The structures of M1-bufuralol and M2-bufuralol were deduced by LC/MS/MS/MS (Fig. 2). In the case of M1-bufuralol, the LC/MS analysis indicated an apparent [M + H+] at m/z 276. The LC/MS/MS analysis indicated fragments at m/z 220 and at m/z 202. The LC/MS/MS/MS analysis indicated a fragment at m/z 160. Judging from these results and the spectra of bufuralol (data not shown), M1-bufuralol was identified as 1′-oxobufuralol. 1′-Oxobufuralol has been reported as a bufuralol metabolite in humans, eluted just after 1′-hydroxybufuralol on HPLC (Yamazaki et al., 1994). In the case of M2-bufuralol, the LC/MS analysis indicated an apparent [M + H+] at m/z 260. The LC/MS/MS analysis indicated a fragment at m/z242. The LC/MS/MS/MS analysis indicated a fragment atm/z 186. From these results, M2-bufuralol was identified as 1′2′-ethenylbufuralol. Recently 1′2′-ethenylbufuralol has been demonstrated to be a metabolite formed by CYP2D6 (Hanna et al., 2001). However, this is the first report that 1′2′-ethenylbufuralol was formed from bufuralol by rat CYP2D isoforms. HPLC profiles of the metabolism of bufuralol and debrisoquine by rat hepatic microsomes. Bufuralol (10 nmol) (a) or debrisoquine (50 nmol) (b) was incubated with rat hepatic microsomes (0.2 mg) and NADPH (0.2 μmol) in a final volume of 0.5 ml of 0.1 M potassium phosphate buffer, pH 7.4, at 37°C for 10 min or 15 min. Metabolites and substrates were isolated by HPLC. 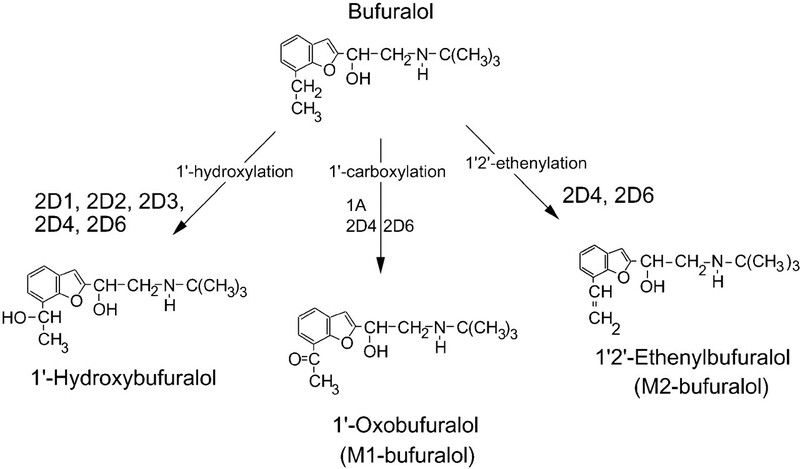 Identification of M1-bufuralol and M2-bufuralol. 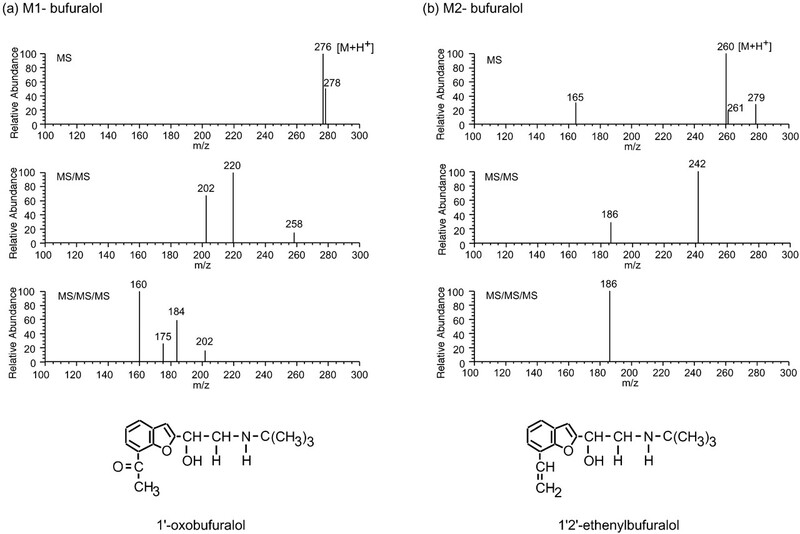 LC/MS, LC/MS/MS, and LC/MS/MS/MS analyses of M1-bufuralol (a) and M2-bufuralol (b) were carried out as described under Materials and Methods. To reveal the contribution of the CYP2D isoforms to the formation of the three bufuralol metabolites, inhibition experiments using anti-CYP2D antibodies were performed (Fig.3). Anti-CYP2D antibodies inhibited both 1′-hydroxylation (1′-hydroxylbufuralol formation) and 1′2′-ethenylation (1′2′-ethenybufuralol formation) activities in rat and human hepatic microsomes, to less than 10% of the control activity, which was measured without any antibodies. 1′-Carboxylation (1′-oxobufuralol formation) activity was also partly inhibited by anti-CYP2D antibodies. These results suggested that the 1′2′-ethenylation and 1′-hydroxylation of bufuralol were catalyzed by CYP2D isoforms and that the 1′-carboxylation was catalyzed by several isoforms including CYP2D. Next, we measured the bufuralol oxidation activity of each P450 isoform (Fig. 4, Table 1). All CYP2D isoforms tested in this study possessed activity for the 1′-hydroxylation of bufuralol. Human CYP2D6 had the highest 1′-hydroxylation activity of all isoforms tested, followed by CYP2D2 and CYP2D4. Among the purified rat P450 isoforms, CYP1A and CYP2C11 have this activity but at low levels. In the case of 1′-carboxylation, human CYP2D6 had very high activity. In rats, CYP2D2, CYP2D3, and CYP2D4 had this activity. CYP1A1 had a much higher level of 1′-carboxylation activity than the rat CYP2D isoforms. These results supported the findings that anti-CYP2D antibodies did not inhibit completely the 1′-carboxylation of bufuralol (Fig. 3). Both CYP2D and CYP1A isoforms were considered to contribute to the formation of 1′-carboxybufuralol from bufuralol in rats. Mimura et al. (1994) has demonstrated that M-1, a metabolite that was eluted just after 1′-hydroxybufuralol on HPLC, was formed by CYP1A1 and CYP1A2 in rats, though it was not documented as 1′-carboxybufuralol. Also in humans, the 1′-carboxylation of bufuralol has been demonstrated to be mediated by CYP1A2 (Yamazaki et al., 1994). CYP2D4 and CYP2D6 had high bufuralol 1′2′-ethenylation activity. CYP2D1 did not have this activity. CYP2D2 and CYP2D3 showed this activity but at low levels: less than 15% of the CYP2D4 activity. Other purified rat P450 isoforms were much less active than CYP2D4 or did not have any activity. Taken together with the data shown in Fig. 3 demonstrating that anti-CYP2D antibody almost completely inhibited the 1′2′-ethenylation of bufuralol by rat and human hepatic microsomes, these results indicated that the 1′2′-ethenylation activity was specific to rat CYP2D4 and human CYP2D6. Inhibition of bufuralol metabolism by anti-CYP2D antibodies in rat and human hepatic microsomes. Rat (●, ○) and human (▴, ▵) hepatic microsomes were preincubated with various amounts of anti-CYP2D antibodies (●, ▴) or control antibodies (○, ▵) at room temperature for 15 min. After preincubation, bufuralol and 0.1 M potassium phosphate buffer, pH 7.4 were added to the mixture on ice. The reaction was initiated by adding NADPH (0.2 μmol). Control activity was measured without any antibodies and is shown as 100% on the y-axis. Catalytic activities of rat and human P450 isoforms. 1′2′-Ethenylbufuralol is considered to be formed both from bufuralol by ethenylation and from 1′-hydroxybufuralol by dehydration. To clarify whether 1′2′-ethenylbufuralol was formed from bufuralol via 1′-hydroxybufuralol, we assayed the 1′2′-ethenylation activity using 1′-hydroxybufuralol as a substrate (Table 1). We could not detect 1′2′-ethenylbufuralol when 1′-hydroxybufuralol was used as a substrate at a final concentration of 30 μM. In contrast, we could detect 1′2′-ethenylbufuralol using bufuralol as a substrate, even though the final concentration of bufuralol was 20 μM. The results suggested that 1′2′-ethenylbufuralol was formed directly from bufuralol, not via 1′-hydroxybufuralol. We summarized the metabolism of bufuralol by CYP2D in Fig.5. Three metabolites were produced by rat and human hepatic microsomes. All human and rat CYP2D isoforms tested in this study had 1′-hydroxylation activity, a potential probe of CYP2D activity (Gonzalez, 1996). The 1′-hydroxylation activity is considered to be common to all CYP2D isoforms. We have already demonstrated that CYP2D2 had an extremely low Km value for bufuralol 1′-hydroxylation activity compared with other CYP2D isoforms (Chow et al., 1999). Therefore in rats, CYP2D2 is likely to predominantly catalyze the 1′-hydroxylation of bufuralol, though all CYP2D isoforms have this activity. 1′-Oxobufuralol, which was eluted just after 1′-hydroxybufuralol on HPLC, was catalyzed by both CYP1A and the CYP2D isoforms. The 1′2′-ethenylation of bufuralol was catalyzed by only rat CYP2D4 and human CYP2D6. A specific activity for CYP2D4 had not been reported until now. This is the first report that in rats, CYP2D4 has specific activity for the 1′2′-ethenylation of bufuralol. Debrisoquine is a classical substrate for CYP2D isoforms and a probe for CYP2D activity as well as bufuralol. The level of 4-hydroxydebrisoquine formed from debrisoquine is used in the judgment of CYP2D6 polymorphism in vivo (Woolhouse et al., 1979). The HPLC profile of debrisoquine metabolism by rat hepatic microsomes is shown in Fig. 1b. Human hepatic microsomes also showed the same profile (data not shown). Debrisoquine was metabolized to 4-hydroxydebrisoquine and M1-debrisoquine. 4-Hydroxydebrisoquine was eluted at a retention time of about 8.5 min and was a major metabolite. M1-Debrisoquine eluted at a retention time of 11 min. The structure of M1-debrisoquine was identified by LC/MS and NMR analysis. The MS spectrum of M1-debrisoquine gave a protonated molecular ion atm/z 192, and collision-induced decomposition led to a fragment at 174 (Fig. 6). The ion atm/z 174, a loss of 18 Da, suggested cleavage of a hydroxy group from the protonated molecular ion [M + H+]. Because the mass number of debrisoquine was 175, the ion at m/z 192 was suggested to be a protonated ion of hydroxylated debrisoquine at the 1-, 3-, or 4-position. 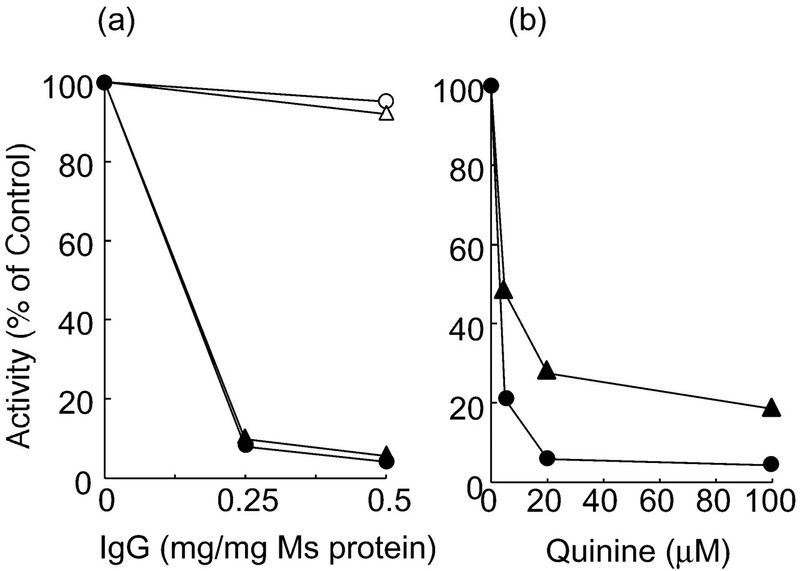 To identify the hydroxylated position on debrisoquine, a1H-NMR spectrum of M1-debrisoquine was measured. The peaks of 1-CH2 (sharp AB quartet), 3-CH-OH (broad singlet) and 4-CH2 (broad AB quartet) were observed at 4.4, 5.6, and 3.1 ppm, respectively (data not shown). Based on these data, M1-debrisoquine was assigned as 3-hydroxydebrisoquine. 3-Hydroxydebrisoquine has been reported to be one of the debrisoquine metabolites produced by CYP2D6 (Eiermann et al., 1998). LC/MS (top) and LC/MS/MS (bottom) analyses of M1-debrisoquine found in reaction mixtures containing debrisoquine and CYP2D1. LC/MS/MS analysis was carried out by collision-induced decomposition of m/z192 base peaks as described under Materials and Methods. To clarify that the CYP2D isoforms are responsible for the formation of 4-hydroxy and 3-hydroxydebrisoquines, inhibition experiments were performed using anti-CYP2D antibodies and a chemical inhibitor (Fig.7). Anti-CYP2D antibodies inhibited both 4-hydroxylation and 3-hydroxylation by rat hepatic microsomes, to less than 5% of the control activity. Quinine, which is a typical chemical inhibitor for CYP2D isoforms (Otton et al., 1984), also inhibited the 4-hydroxylation and 3-hydroxylation activities of rat hepatic microsomes, though some 3-hydroxylation activity remained. These results indicated that both 4-hydroxylation and 3-hydroxylation were catalyzed by CYP2D isoforms in rats. Inhibition studies of debrisoquine hydroxylation using rat hepatic microsomes. a, rat hepatic microsomes were preincubated with various amounts of anti-CYP2D antibodies (●, ▴) or control antibodies (○, ▵) at room temperature for 15 min. After preincubation, debrisoquine and 0.1 M potassium phosphate buffer, pH 7.4, were added to the mixture on ice. The reaction was initiated by adding NADPH (0.2 μmol). (●, ○) and (▴, ▵) indicate 4-hydroxylation activity and 3-hydroxylation activity, respectively. Control activity was measured without any antibodies and is shown as 100% on the y-axis. b, debrisoquine was incubated with rat hepatic microsomes (0.2 mg) and NADPH (0.2 μmol) in a final volume of 0.5 ml of 0.1 M potassium phosphate buffer, pH 7.4, at 37°C for 10 min in the presence of quinine. (●) and (▴) indicate 4-hydroxylation activity and 3-hydroxylation activity, respectively. We investigated the catalytic properties of CYP2D isoforms toward debrisoquine using recombinant enzymes. 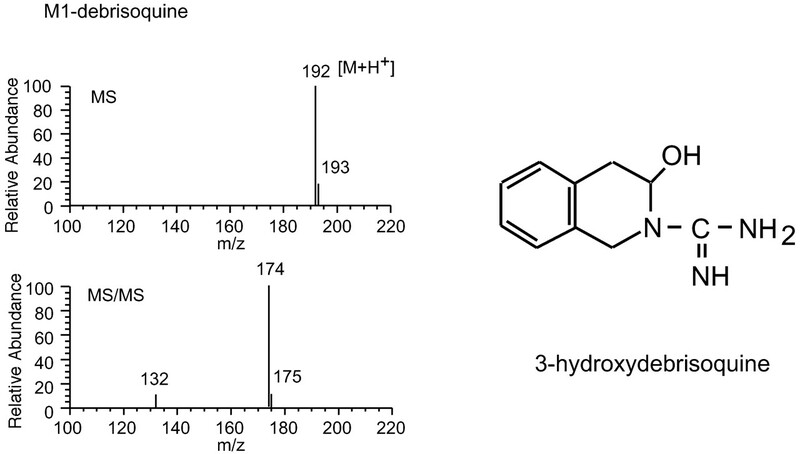 Human CYP2D6 and rat CYP2D2 had high levels of 4-hydroxylation activity (Fig.8). TheKm values of CYP2D2 and CYP2D6 for the 4-hydroxylation of debrisoquine were low, 6.87 ± 0.62 and 13.0 ± 1.1 μM, respectively (Table2). CYP2D1 also had 4-hydroxylation activity; however, its activity was quite weak, and theKm value of CYP2D1 for 3-hydroxylation was 152 ± 7 μM, much higher than 13.1 ± 1.0 μM, that of CYP2D2. These results suggested that in rats, the 4-hydroxylation of debrisoquine was almost a specific function of CYP2D2. CYP2D6 and CYP2D2 also had 3-hydroxylation activity, but it was weaker than their 4-hydroxylation activity; therefore, the relative ratio of 3-hydroxylation to 4-hydroxylation activity for CYP2D2 and CYP2D6 was low, 0.18 and 0.65, respectively (Fig. 8). Only CYP2D1 had higher 3-hydroxylation than 4-hydroxylation activity; therefore, the relative activity ratio of CYP2D1 was 7.46, very high. Metabolism of debrisoquine by CYP2D isoforms. Debrisoquine was incubated with recombinant CYP2D isoforms and NADPH (0.2 μmol) in a final volume of 0.5 ml of 0.1 M potassium phosphate buffer, pH 7.4, at 37°C for 15 min. Debrisoquine and its metabolites were detected using HPLC-fluorometry. We summarized the pathways of debrisoquine metabolism by CYP2D in Fig.9. In the present study, debrisoquine was metabolized to 4-hydroxydebrisoquine and 3-hydroxydebrisoquine by rat and human hepatic microsomes. Debrisoquine has been demonstrated to be metabolized to three metabolites, 4-hydroxydebrisoquine, 3-hydroxydebrisoquine, and 1-hydroxydebrisoquine by CYP2D6 (Eiermann et al., 1998). In this study, 1-hydroxydebrisoquine was not detected. Human CYP2D6 had high debrisoquine 4-hydroxylation activity. In rats, only CYP2D2 had a very high level of 4-hydroxylation activity, indicating that this activity was specific for CYP2D2 in rats (Al-Dabbagh et al., 1981; Gonzalez et al., 1987). 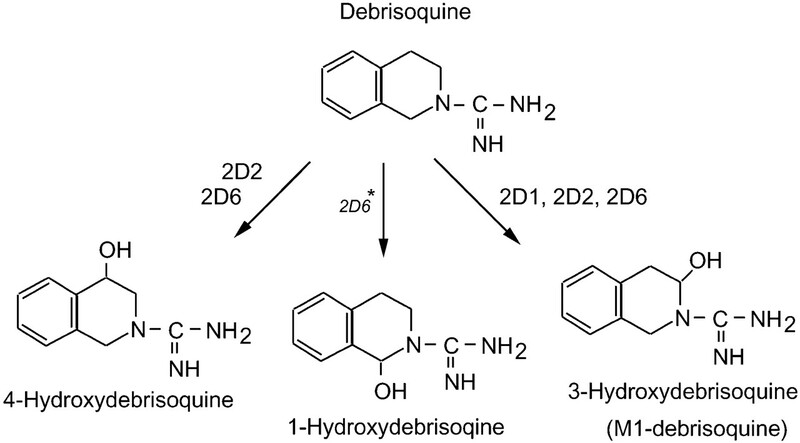 Dark Agouti rats have very low levels of debrisoquine 4-hydroxylation activity. Not enough CYP2D2 protein is expressed in these rats (Yamamoto et al., 1998). These findings support that CYP2D2 catalyzes predominantly the 4-hydroxylation of debrisoquine in rats. 3-Hydroxydebrisoquine was formed by rat CYP2D1, rat CYP2D2, and human CYP2D6. 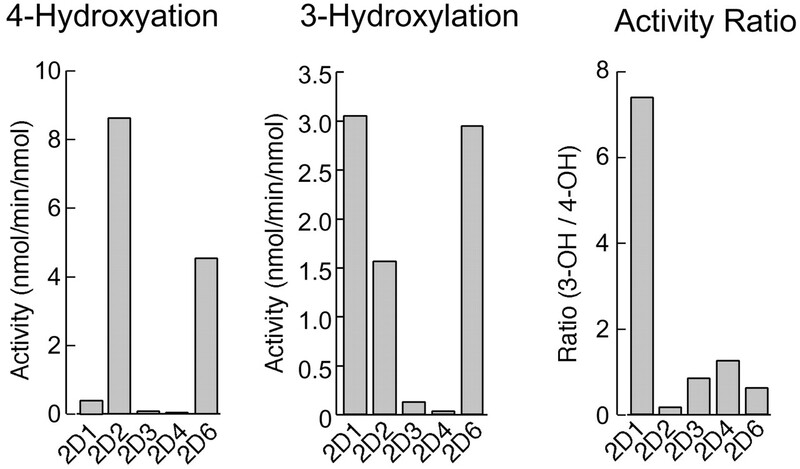 Only CYP2D1 had higher 3-hydroxylation than 4-hydroxylation activity. This was a specific property of CYP2D1. Since theKm value of CYP2D1 for the 3-hydroxylation of debrisoquine was high, CYP2D1 may contribute to this activity when the concentration of substrate is high enough. 2D6*: Eierman et al. (1998) demonstrated this pathway in their study. Propranolol Metabolism by Rat Hepatic Microsomes. We further investigated the metabolic properties of CYP2D using propranolol (Table 3). Propranolol is used clinically as a β-blocker and is one of the substrates of CYP2D (Masubuchi et al., 1993; Masubuchi et al., 1994). Propranolol is known to be metabolized to four main metabolites (4-, 5-, 7-hydroxylpropranolol and N-desisopropylpropranolol) by rat hepatic microsomes (Masubuchi et al., 1993). In humans, propranolol was metabolized to three main metabolites (4-, 5-hydroxylproranolol andN-desisopropylpropranolol) (Masubuchi et al., 1994). In humans and rats, the N-desisopropylation has been reported to be catalyzed by CYP1A and/or CYP2C isoforms, not CYP2D isoforms (Fujita et al., 1993; Yoshimoto et al., 1995). CYP2D6 had high 4- and 5-hydroxylation activities but very low 7-hydroxylation activity. In rats, CYP2D2 and CYP2D4 had higher levels of 4-hydroxylation activity than CYP2D1 and CYP2D3. The 5-hydroxylation of propranolol was catalyzed by several CYP2D isoforms, but the levels of activity catalyzed by rat CYP2D isoforms were very low. The 7-hydroxylation was catalyzed only by CYP2D2 in rats. The 7-hydroxylation activity of rat hepatic microsomes was inhibited by anti-CYP2D antibodies to less than 10% of the control (data not shown). This suggests that the 7-hydroxylation activity was specific to CYP2D2. In conclusion, we demonstrated the catalytic properties of the rat and human CYP2D isoforms. Each CYP2D isoform had specific properties in terms of catalytic activity. CYP2D4 selectively metabolized bufuralol through 1′2′-ethenylation whereas CYP2D2 selectively metabolized debrisoquine through 4-hydroxylation and propranolol via 7-hydroxylation. These activities are useful as a probe for rat CYP2D isoforms. We thank Dr. Takanori Hashizume (Pharmacokinetics and Physico-Chemical Property Research Laboratories, Dainippon Pharmaceutical Company, Ltd., Osaka) for support in NMR analysis of 3-hydroxydebrisoquine. We also thank Atsuko Tominaga for technical support. This work was supported in part by a Grant-in-Aid from the Ministry of Education, Science and Culture of Japan. (1981) Animal modelling of human polymorphic drug oxidation-the metabolism of debrisoquine and phenacetin in rat inbred strains. J Pharm Pharmacol 33:161–164. (1996) CYP2D6 mRNA expression in circulating peripheral blood mononuclear cells correlates with in vivo debrisoquine hydroxylase activity in extensive metabolizers. Res Commun Mol Pathol Pharmacol 91:149–159. (1999) Developmental changes in the catalytic activity and expression of CYP2D isoforms in the rat liver. Drug Metab Dispos 27:188–192. (1990) The genetic polymorphism of debrisoquine/sparteine metabolism-clinical aspects. Pharmacol Ther 46:377–394. (1998) 1- and 3-Hydroxylations, in addition to 4-hydroxylation, of debrisoquine are catalyzed by cytochrome P450 2D6 in humans. Drug Metab Dispos 26:1096–1101. (1993) Regio- and stereoselective propranolol metabolism by 15 forms of purified cytochromes P-450 from rat liver. J Pharmacol Exp Ther 264:226–233. (1985) Simultaneous purification of multiple forms of rat liver microsomal cytochrome P-450 by high-performance liquid chromatography. Biochim Biophys Acta 842:119–132. (1987) Purification and characterization of liver microsomal cytochrome P-450 from untreated male rats. Biochim Biophys Acta 926:349–358. (1988) Purification and characterization of diabetes-inducible cytochrome P-450. Biochem Int 16:503–509. (1996) The CYP2D subfamily. in Cytochromes P450: Metabolic and Toxicological Aspects, ed Ioannides C (CRC Press, New York), pp 183–210. (1987) Debrisoquine 4-hydroxylase: characterization of a new P450 gene subfamily, regulation, chromosomal mapping and molecular analysis of the DA rat polymorphism. DNA 6:149–161. (1997) Evidence for CYP2D6 expression in human lung. Biochem Biophys Res Commun 241:79–85. (1996) Detection of cytochrome P450 gene expression in human placenta in first trimester of pregnancy. Biochem Pharmacol 52:379–383. (2001) Diversity in mechanisms of substrate oxidation by cytochrome P450 2D6. Lack of an allosteric role of NADPH-cytochrome P450 reductase in catalytic regioselectivity. J Biol Chem 276:39553–39561. (1995) Developmental and endocrine regulation of P450 isoforms in rat breast. Mol Pharmacol 48:630–638. (1998) Tissue distributions of CYP2D1, 2D2, 2D3 and 2D4 mRNA in rats detected by RT-PCR. Biochim Biophys Acta 1380:305–312. (1997) Alternative splicing of CYP2D mRNA in human breast tissue. Arch Biochem Biophys 343:101–108. (1996) Multiple forms of human P450 expressed in Saccharomyces cerevisiae. Systematic characterization and comparison with those of the rat. Biochem Pharmacol 51:1041–1050. (1995) cDNA cloning of three new forms of rat brain cytochrome P450 belonging to the CYP4F subfamily. Biochem Biophys Res Commun 217:1137–1144. (1993) A novel P450 expressed at the high level in rat brain. Biochem Biophys Res Commun 196:721–728. (1994) Cytochrome P450 isozymes involved in propranolol metabolism in human liver microsomes. The role of CYP2D6 as ring-hydroxylase and CYP1A2 as N-desisopropylase. Drug Metab Dispos 22:909–915. (1993) Regioselective contribution of the cytochrome P-450 2D subfamily to propranolol metabolism in rat liver microsomes. Drug Metab Dispos 21:1012–1016. (1996) Characterization of the oxidation reactions catalyzed by CYP2D enzyme in rat renal microsomes. Life Sci 58:2431–2437. (1989) The CYP2D gene subfamily: analysis of the molecular basis of the debrisoquine 4-hydroxylase deficiency in DA rats. Biochemistry 28:7349–7355. (1990) Sequence requirements for cytochrome P-450IID1 catalytic activity. A single amino acid change (Ile380Phe) specifically decreases Vmax of the enzyme for bufuralol but not debrisoquine hydroxylation. J Biol Chem 265:17197–17201. (1994) Differential roles of cytochromes P450 2D1, 2C11 and 1A1/2 in the hydroxylation of bufuralol by rat liver microsomes. Biochem Pharmacol 47:1957–1963. (1996) P450 superfamily: update on new sequences, gene mapping, accession numbers and nomenclature. Pharmacogenetics 6:1–42. (1990) The dopamine transporter and cytochrome P450IID1 (debrisoquine 4-hydroxylase) in brain: resolution and identification of two distinct [3H]GBR-12935 binding proteins. Arch Biochem Biophys 276:424–432. (1993) Characterization of two P-450 isozymes placed in the rat CYP2D subfamily. Biochim Biophys Acta 1158:227–236. (1984) Competitive inhibition of sparteine oxidation in human liver by beta-adrenoceptor antagonists and other cardiovascular drugs. Life Sci 34:73–80. (1994) Correlation of polymorphic expression of CYP2D6 mRNA in bladder mucosa and tumor tissue to in vivo debrisoquine hydroxylase activity. Carcinogenesis 15:1955–1961. (1997) Expression of four rat CYP2D isoforms in Saccharomyces cerevisiae and their catalytic specificity. Arch Biochem Biophys 348:383–390. (1979) Debrisoquin hydroxylation polymorphism among Ghanaians and Caucasians. Clin Pharmacol Ther 26:584–591. (1998) Molecular basis of the Dark Agouti rat drug oxidation polymorphism: importance of CYP2D1 and CYP2D2. Pharmacogenetics 8:73–82. (1994) Bufuralol hydroxylation by cytochrome P450 2D6 and 1A2 enzymes in human liver microsomes. Mol Pharmacol 46:568–577. (1995) Identification of human CYP isoforms involved in the metabolism of propanolol enantiomers–N-desisopropylation is mediated mainly by CYP1A2. Br J Clin Pharmacol 39:421–431. (1996) Characterization of rat small intestinal cytochrome P450 composition and inducibility. Drug Metab Dispos 24:322–328.